it just sounds like the beginning of a joke or something. but this is not a joke, this is real life, my friends. it is also real life that i am typing this with one hand, while unwrapping some snickers with my other hand. with occasional help from my toes. i feel like i go a little crazy on the candy on halloween. why? well, i didn't grow up celebrating halloween because as you all know, my parents were mean. haha. not really, but they were just doing what they thought was right. now look at them...walking around with my kids yelling trick-or-treat! i love satan! not really. my moms going to send me an angry text for writing that. growing up, we celebrated "Lord of the Harvest". which was like a halloween carnival for church-ee people. and was shockingly similar to celebrating halloween. with biblical costumes though. and a few witches...but those were people who didn't get the secret memo and were frowned upon and judged as they were having fun getting their face painted with a bible on it. but whatever. so back to the costumes. audrey(my sis) and i decided george would be charlie brown and lila would be his side kick lucy. or is it his nemesis? here my dad is trying to teach lila to hold the football in place for george. to get royally screwed. it kinda looks like the show, huh? my dad dressed up as a guy that is flipping a house down the street. oh wait. he is. nice sweats. 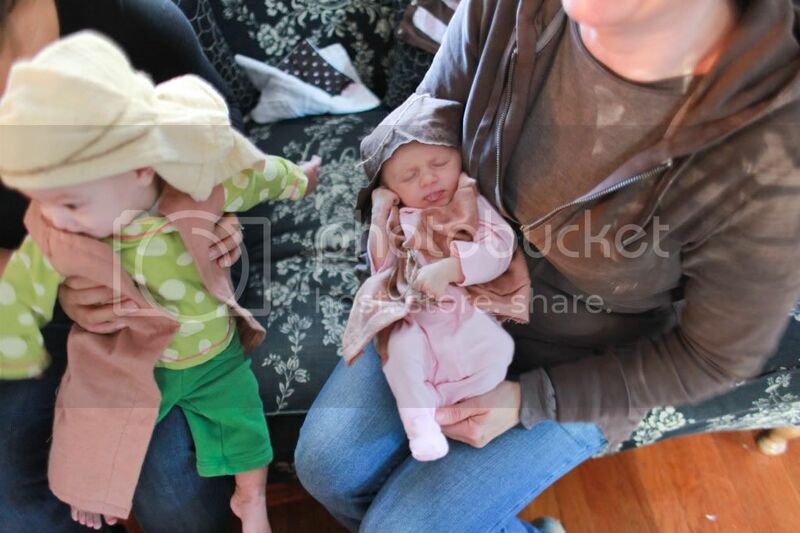 and here is the only picture of george and lila together because they were too busy running around. making each other scream. 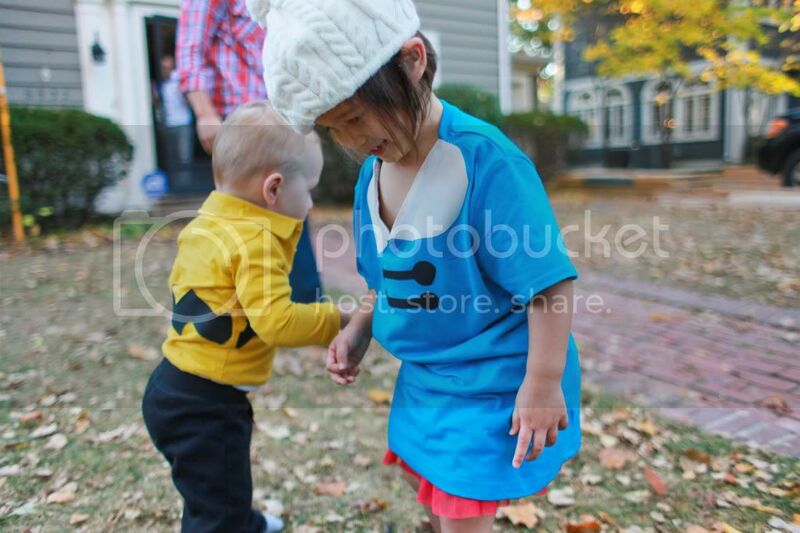 anyway, then we thought it would be funny to have the little babers dress as peanuts. get it? well, audrey sewed the "peanut" costumes, which actually turned out to be biblical character costumes. i mean, what are the odds of that happening? high. very high...when you don't sleep. i mean, you have to give it to audrey, she's sewing these things when she had a newborn. which is dumb and i tried to talk her out of it. so of course, she probably thought they were amaze-balls as she sewed them and then the next morning realized they didn't look like peanuts at all. they looked like ye shepherd children of old. so whatever, the Lord willed it and so it was. except that i think the angels also smiled upon me the night before halloween when i was at target buying pull-ups and 15 other items i didn't need. as i passed an endcap, i saw a turtle costume. my heart jumped because, as you know, i birthed a turtle named penelope. so it was perfect. except the costume was for dogs. but this is neither here nor there. i still bought it, as penelope is the size of a medium to large dog... as fate would have it. and layne was a ninja. i tried to get him to be snoopy, but he was like...pshhh, no way, i'm bein' a black ninnnnnnnnja, mom. yes, that is a shin guard on his arm. as fate would also have it, we had all this stuff in our house for this costume. PTL. here are all three of the nuggets together. 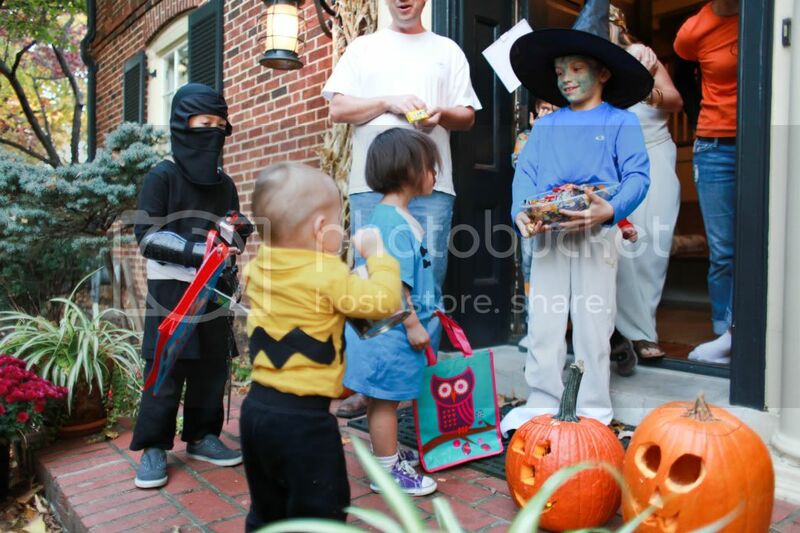 and here the kiddos are getting candy. except this house was handing out beers to the neighbors too. now that's classy. and as if this weren't already too many pictures...please enjoy one more turtlee-turtle face bidding you farewell. happy sweet treats day! aka halloween. i am friggin' laughing and rolling on the floor. my hubby keeps giving me strange looks. this is the most hilarious post i've read in a long time on any blog. -how the babesters were dressed as peanuts, in cognito 'ye shepherd children of old'. i love all those costumes!!! and the turtle. oh my, kill me with cuteness. it was meant to be, God said so. LOVE the costumes! 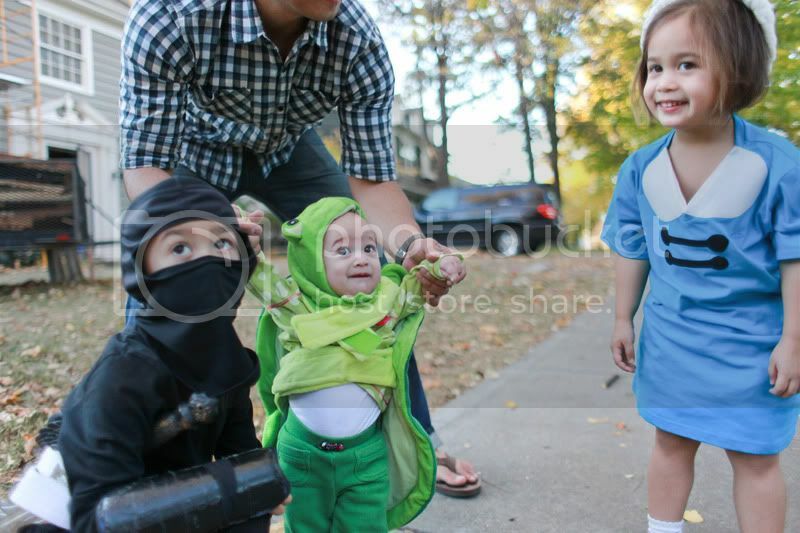 The Ninja, Charlie Brown & Lucy are adorable, but that Turtle is just too much! So cute. Oh yes, oh yes, oh yes. Thank you from the bottom of my heart for the laugh this caused! Such a blessing you are, Jami. oh dear. I love Miss Penelope even more now that I've met her. And the other kiddos too. So cute. You absolutely crack me up! Between the shin guards, dog costume and the peanuts I was literally laughing out loud & thinking your life is a crazy as mine! You are just way better at pictures! Your littles are simply adorable! seriously laughed out loud and maybe snorted a little. and i think i injured my lower lip on my braces from a sudden too big smile. thanks a lot lord of the harvest/late night costume shenanigans. this all makes me incredible happy. awww those little shepherd babes. Oh sweet baby turtle! Dear lawdy! I love your children. We also did not participate in Halloween when we kids. So funny how things change. This year my parents were sandy & Danny from grease! Had to chuckle a little when I saw the turtle costume cuz I could only assume (and was right!) what was coming next!! Penelope looks precious. Love Lila's little bob cut! SO cute. cute! that is the same opening i used for my halloween post too, haha! this is the funniest thing I"ve ever seen. I am laughing so hard that you bought a dog costume for your daughter. Hilarious. And I loved the peanut costumes. oh man, this was a good one. This is the best post ever. Love it. All of it! I laughed so hard I have tears in my eyes. Also grew up in a non-Halloween family. Your comments are hysterical. And the peanuts turned shepherds, and the sweet adorable turtle, and the shin guard: I had to read my husband all those parts. I'm still laughing. And that is THE cutest turtle I've ever seen. Thanks for sharing! The turtle costume made me LOL! Oh my goodness! this is too funny!! Penelope looks absolutely adorable. As do Lila and Layne. So glad you didnt let the fact that it was a dog costume stop you!! haha..
Btw.. it's time for penelope to make it onto the sideboard don't you think? Adorable! And I feel so much better knowing I'm not the only one who's ever put my baby in a dog costume. It is funny that everyone thinks this is the funniest post they have ever read. THIS IS REAL LIFE PEOPLE. I had lunch with that ninja on Monday. The baby crawls! (The turtle costume is awesome, by the by.) Anywho - thanks again. is penelope crawling?!?! amazeballs as you would say. GREAT costumes. 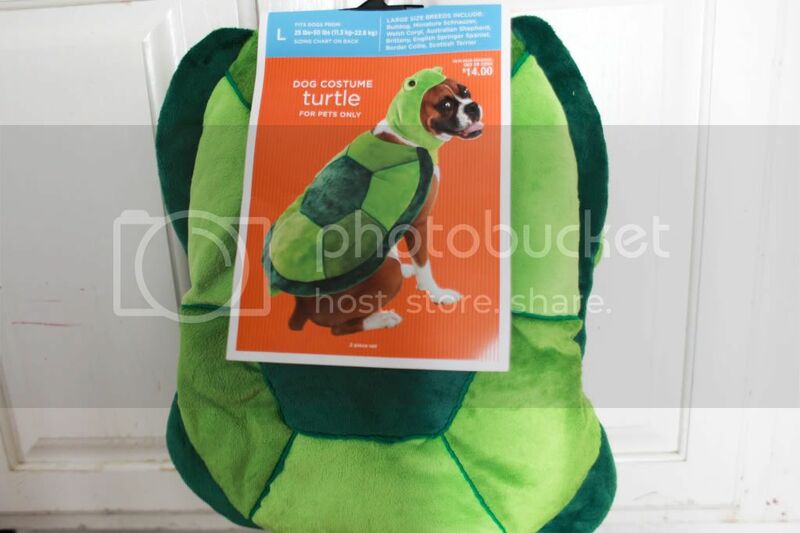 maybe your pup can be the turtle next year?! haha. - Lila looks JUST like her Mom. Like seriously, identical. She is stunning!! - Lane's shin guards on the arms literally made me snort as I was laughing. - Loving your Pops' Mizzou shirt. I figured you guys would be Kansas fans. GO Tigers! I have tears in my eyes. You would put your child in a dog costume. I wish I had thought of that. Next year... next year. You always have me cracking up! It is funny how the "Fall Festival" sure looks just like Halloween! Ha! I wish my neighborhood had trick-or-treaters in cute, creative & homemade costumes half as good as yours!! 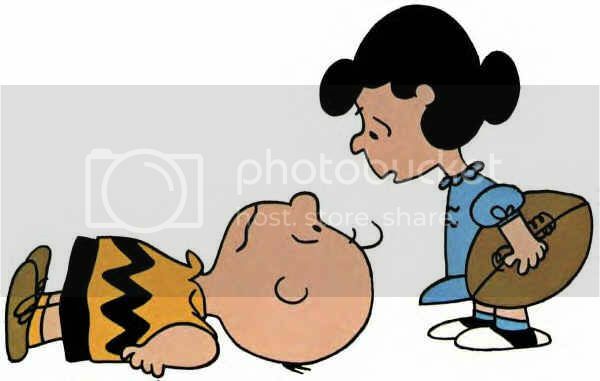 Lucy & Charlie Brown were adorable! Glad you and your family had a happy Halloween!! They are so wicked cute. LOVE them. And the dog costume on a baby makes total sense to me. 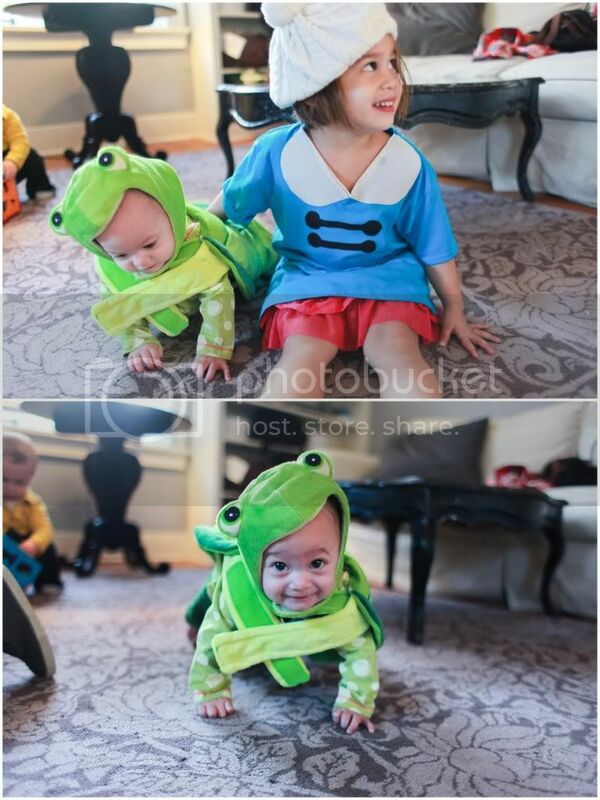 True story: My Henry wore this exact turtle costume last Halloween. My whole family was like, "What's wrong with you. Erin? 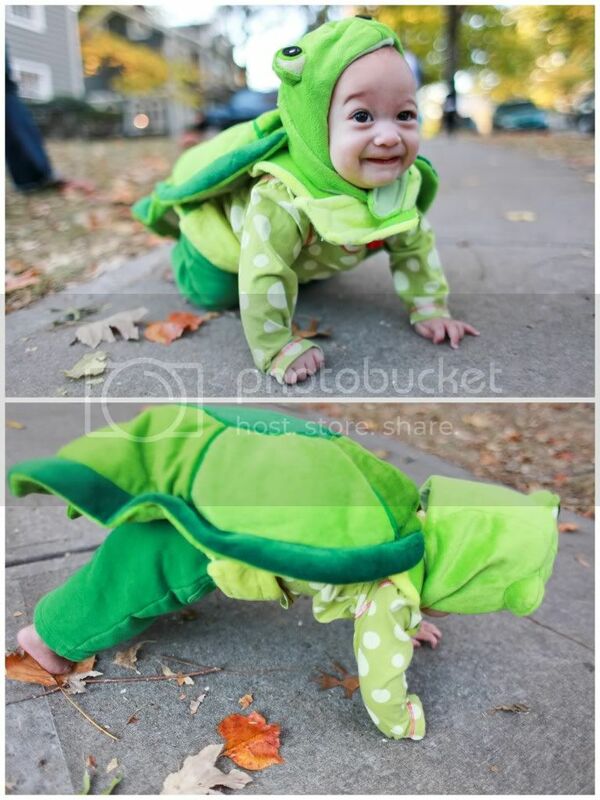 Why did you buy a turtle costume for your baby?" And I was like, "Um, it was cheaper than the other costumes." And then I paired it with green leggings and everyone was even more angry. I mean really, boys in leggings, aren't there worse things in the world? I think yes. ive never laughed so hard at a post in all my blog reading life. the couch is shaking and the dog at my side is getting annoyed because i woke him up. the costume for dogs put me over the edge. 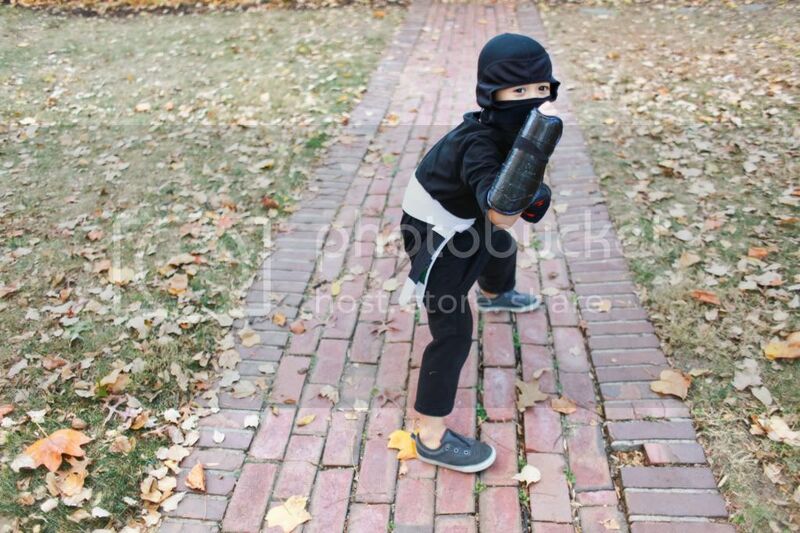 i had a black ninja too and somehow when they put that stuff on, all their physical movements really do change into ninja ones, huh? Kid in a dog costume - GENIUS! I bet it was a lot cheaper too. june is holy, and penelope is the sweetest. love that gummie smile. your humor is too much for me. thanks for making me laugh out loud. story's costume last year, a banana split, was also for doggies! the shepherd Bible times children "peanut" costumes are hilarious. i love to see 2 sisters blogging and photographing and sharing creativity. and making people laugh. you got a good thing goin'. Dog costumes? Perfect for little crawlers, I say! I mean, hello, they are on all fours. And the rest of the kids? Presh. Happy Halloween Hangover! HA! Hilarious post. Cute kiddos! cannot stop laughing. tried. cannot stop. bahahahaha...love the turtle. love all of them, but the turtle, oh my! You dressed your kid in a dog costume! Ahhhh hahahahahahahaha! I just LOL'd and the dogs looked at me strange, as they are the only ones home whilst I'm reading this. Love you and your creativity! 1. Love the costumes. Cutie kiddos, as always. 2. 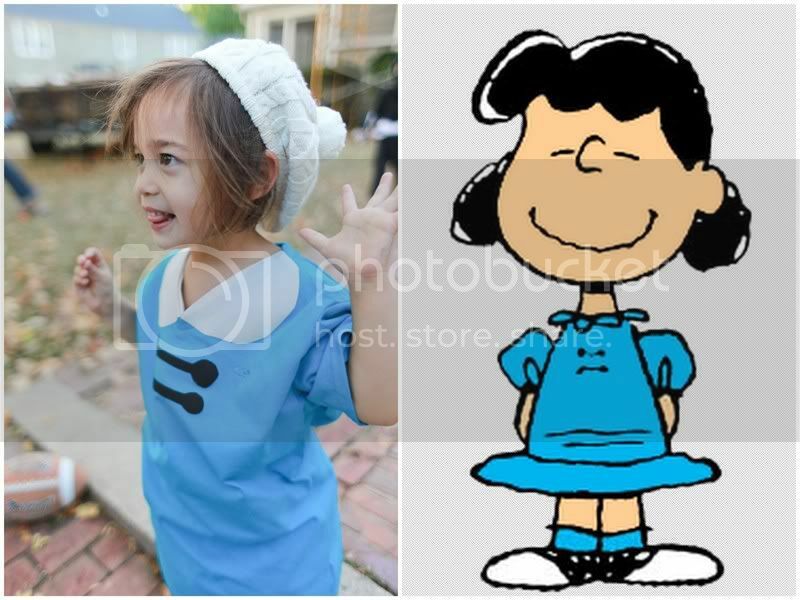 When I was a kid, my older brother called me Lucy...a) because I looked like her b) because I acted like her. 3. You HAVE to stop saying "amaze-balls." Disgusting. I won't be your friend if you don't stop. it is impossible to express how much laughter went on at our house as i read this post. classic. love it. your most recent post on the affair did not lead to any laughter, but did result in many amens on why you share. in other words: i'm so glad you share each thing you do. Ok, I have looked at this post atleast 3 times and have laughed everytime! I love the turtle outfit! So great! hahahahhaa... this is soooo much fun. i really rofled! so ur kids put together= ninja turtles ;) and lila as lucy, wonderfull. Penelope is thee cutest and sweetest thing. Apparently my kids are underfoot when I read your blog because my 5 year old (in a loud voice at odd times ) keeps telling me that "PENEWOPEEE SLEEPS ON THE STAIRS!!" 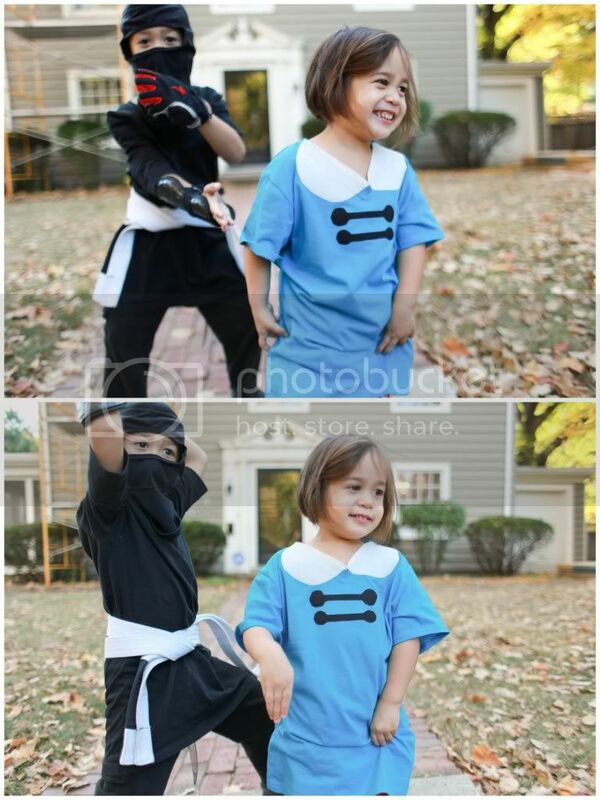 What kind of shapes of iron on's did you use for the Lucy costume? i just jimmy rigged the shapes...i browsed some lucy images on google. hope that helps! i love the shepherd children of old comment. Wow. they really do look like they are ready for a Christmas pageant or something. Too funny jami. TOO FUNNY.